Ice was in the news quite a lot last week. There was, for example, the news that Antarctica could be gaining, not losing, ice, at least for now. Lest you were tempted to breathe a sigh of relief, critics pointed to contrary evidence. And there were also these unsettling findings about the gigantic West Antarctic Ice Sheet. But far to the north, some equally important news unfortunately got less attention. For the long and short of it, see the animation above. The animation shows computer model simulations of how Arctic sea ice is likely to respond to continued human-caused warming. More specifically, it models how the number of days of open water change each year from 1920 to 2100 under a “business-as-usual” scenario. By 2100, according to the study, much of the Arctic has greater than 150 additional days of open water as compared with the pre industrial period prior to 1850. But we won’t have to wait that long to see significant changes. If greenhouse gas emissions continue to rise, the entire coastline of the Arctic, and most of the Arctic Ocean itself, will see at least 60 additional days a year of open water by mid-century. Some sites will even see 100 additional open water days. What’s going to happen in their neck of the woods? Specifically where will melting sea ice leave behind open water? For how long during the course of a year will that water actually stay open? When will these changes become so significant that they’ll completely exceed natural variability? To understand why these are important questions, imagine that you’re a polar bear. Seals are your main source of food, and to hunt them you need to perch on sea ice. Your life is already more difficult, thanks to shrinking ice. But what might happen to you and your kin in the future? Scientists could get a better fix on this if they knew where open water is likely to occur in a warming climate, and how long it might stay open each year. And if you happen to be the owner of, say, a shipping company in China, you may be hoping that shrinking Arctic sea ice will allow you to send your ships to Europe along the Northern Sea Route, which runs off Russia’s Arctic coast. It offers a much shorter sail to Europe than the long way around through the Suez Canal. Right now, sea ice even in summer usually makes the route impractical, at best. Knowing where and when open water will occur in coming years could be quite useful to your business as you plan for the future. Throughout the Arctic, the open water season began lengthening in the 1990s, “with ice break-up starting earlier and freeze-up setting in later,” Barnhart says. The study also showed that this marked the beginning of a shift away from preindustrial conditions. Even so, for most locations, the shift remains within the natural range of preindustrial times. And that means what we’ve seen in the Arctic so far has been the result of both the natural, internal variation of the climate system itself plus a push from us through our greenhouse gas emissions. But the study also shows that by 2040, increases in open water driven by human-caused warming will completely exceed the range of variability seen prior to 1850. As part of the study, which appeared last week in the journal Nature Climate Change, Barnhart and her colleagues also examined specific places along the Arctic coastline, including Drew Point on Alaska’s North Slope. Here, open water once was present for an average of 50 days each year. Since about 2000, both satellite observations and the scientists’ model simulations show an increasing open water trend. The coastal retreat is happening because sea ice ordinarily fortifies the coastline against wave action and storm surges. With more days of open water, and therefore less protection, erosion has increased — a phenomenon that has posed significant challenges for some Alaskan North Slope communities. With continuing increases in greenhouse gas emissions, things are likely to get worse. At Drew Point, the simulations show that sea ice is likely to be absent for almost 200 days by 2070. The Arctic is warming and the sea ice is melting, with impacts on Arctic people and ecosystems . . . By the end of this century, assuming a scenario of continued business-as-usual greenhouse gas emissions, the Arctic will be in a new regime with respect to open water, fully outside the realm of what we’ve seen in the past. In the animation, notice how the Arctic ice disappears precisely at 2100. Reminds me of a jagged graph showing my ability to draw a mountain over time. 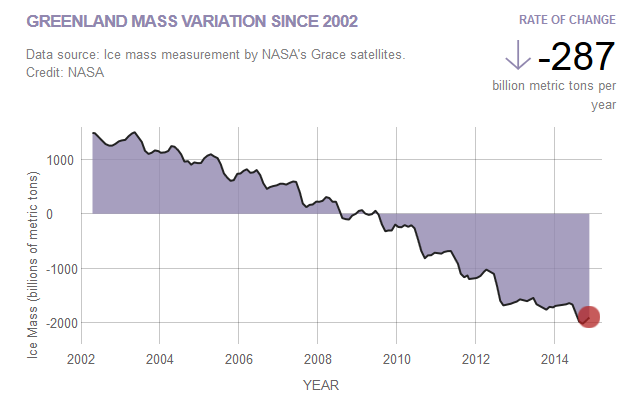 Both charts confirm the increase in sea ice volume since 2007. Mr. Wilson, if you know my claim is that you are mentally ill, why would you go out of your way to prove me right? Who said anything about 1979? You need a remedial reading course. Now stop playing doctor, stop picking your nose, pick up that gum, and get back to your homework before we take your computer away! The people who study the subject, Mr. Wilson. Is it normal for a person to look at a graph of declining ice volume and say ice is not declining but increasing? Is that what you think mentally healthy people do? Do you not want to be taken seriously? Greenland is NOT sea ice. Good! That’s right, Mr. Wilson! Is the ice on Greenland growing or shrinking? How much evidence needs to be piled on top of your head before it pops like a grape? Tell us how it feels? You would, actually, if you had read my post! Mr. Wilson, is the ice on Greenland growing or shrinking? Ever heard of ice ages? Of course it is what? Is the ice on Greenland growing or shrinking? …and so much for you answer. Is the ice on Greenland growing or shrinking, Mr. Wilson? Relax, we get it already. The Antarctic Ice is increasing, BUT, it is “in trouble”. If you weren’t, you wouldn’t be running from such a simple question like a coward. Now, what was the point of posting anything at all if you’re going to make that so obvious? Who’s going to take a person like yourself seriously? Have you heard of ice ages… Every 100,000 years the planet follows a cycle in which the globe warms and cools due to the fluctuations in the axis. The last ice age was 20,000 years ago, which means the Earth is still warming from the last ice age. You are not proving anything. Each and every ice house phase in Earth’s history was caused by a drop in CO₂ beneath current levels and ended by an increase in CO₂ above current levels. …so why would you expect that to be different this time around? But that convenient mini ice age will come to the rescue, right? So no worries, magical thinking can save the day. Next, this article rejects NASA’s latest scientific pronouncement “NASA Study: Mass Gains of Antarctic Ice Sheet Greater than Losses”, and then goes to the (Washington Post??) for rebuttal? Thicker than previously thought, but still melting. As are the glaciers on land, including the massive Greenland icepack. No, my science has long included solar variability, as have most of the current models that still show increasing global temperature averages. No major increases in solar output correlate to the current warming, and any diminished output is likely to be only a slight reprieve from the steady increase in global temperature due to the effect of greenhouse gases we continue to pump into the atmosphere. So your cherrypicking of select articles and particular interpretation of the data does indeed constitute a brand of denial of science, just as reliance upon an as yet undetermined solar variability effect constitutes a belief in a deus ex machina solution to a known (but denied) problem. Yes, there are still some effects of global warming that aren’t entirely accounted for in models, yet none of that changes the fact that greenhouse gases released as a result of human activity are indeed warming the planet and producing ever greater challenges to our civilization. The smart money’s on accepting and addressing the problem, not denying and believing that a solution will provide itself for our benefit without any change to our own behavior. NASA (Quote) “The research, challenges the conclusions of the Intergovernmental Panel on Climate Change’s (IPCC) 2013 report. That a little complicated for you? Well, there is a little complication. Such as the fact that the 0.27 millimeters per year of sea level rise is continuing, whether or not it’s coming from Antarctica, as the previous IPCC projections calculated. And the NASA scientists analyzing the data noted that the melting from the West Antarctic Ice Sheet is continuing, so any disruption of snowfall to the eastern portion of the continent would soon result in a net loss of ice. Greenland remains a prime suspect for the continuing sea level rise, and there’s no indication of significant gains in ice anywhere else. But anything on which to hang that slim thread of hope that humanity hasn’t affected the climate, right? Whether mini ice age, a gain of ice in one part of the globe while otherwise ice masses are in steady retreat, or a cooler than average winter in one part of the world while average temperatures continue to climb, there will always be something for a denier to take heart from, while the rest of us deal with reality. As for the motivation behind your thinking Wilson, that isn’t complicated at all. Ideologues are pretty predictable, after all. At least we agree on one thing. Ideologues ARE predictable. The above post, under the article, by John C. says it well. And, I’m not interested in your predictions, your cult fortune telling means nothing to me. 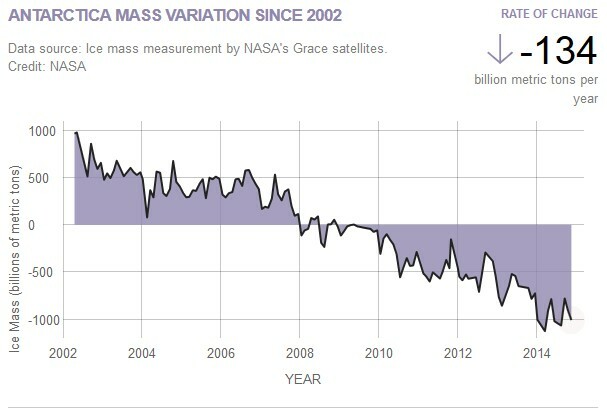 Your figure of 0.27mm per year of seal level rise you say comes from NASA is at odds with the websites of NASA, Wiki, NOAA and NatGeo, who are continuing to estimate annual sea level rise at between 2.5 and 3.5 mm per year. Because if true, the rate of sea level rise is not “continuing unabated”, rather the rate is falling, and that would be a another significant blow to the conventional, consensus loving, AGWers. It might even make the MSM news cycle. The sound of a warmista admitting he’s wrong. Actually, Mr. Wilson, the sea ice does not disappear in the simulation. What is it like to be fully capable of seeing only that which you want to see, rather than what is actually there? Is it liberating? Or stultifying? Just look at the temperature predictions of the IPCC 1990 FAR report and look at reality. Wasn’t even close 35 years later. Yet I am attacked, as delusional, by those who prefer their faith to reality. What a pile of puerile, pretentious, poppycock! There is nothing to explain. It is crystal clear. It will be a struggle for you defend your IPCC position. Even though governments are involved, science primarily drives the IPCC assessments. All reports and documents are created by scientists from all over the world. No struggle. They have their predictions. – Scientists in the US have presented one of the most dramatic forecasts yet for the disappearance of Arctic sea ice.Their latest modelling studies indicate northern polar waters could be ice-free in summers within just 5-6 years. – Former US Vice President Al Gore cited Professor Maslowski’s analysis on Monday in his acceptance speech at the Nobel Peace Prize ceremony in Oslo. I just don’t take the gloom and doom predictions, or their purveyors, seriously at this point. A quiet backwater of science – Weather – was hijacked by political hacks, scientists seeing a sure fire way to advance their careers, green crony capitalists, and far leftists who formed a quasi-religious cult. Actual, serious science is steamrolled by the clown stampede. Depressing for those of us who value deliberative, objective science. And if this scenario doesn’t happen, as previous doom and gloom scenarios haven’t, the settled science of AGW will start to lose credibility, right? Of course not, the doomsday folks will just go on to the next Armageddon. I notice how very little changes until the animation moves out of the real world and into the Computer Simulation Zone.